Who shall live and who shall die? Who shall pray for free and who needs to buy? Okay, so maybe those aren't the exact words of the Unetaneh Tokef prayer on the High Holidays, but "pay to pray" is once again the big conversation as the High Holy Day season approaches with Rosh Hashanah beginning tomorrow evening. A Jewish man comes to the door of a synagogue on Rosh Hashanah without a ticket and explains to the usher that he doesn't want to stay, he just wants to give a message to someone inside. 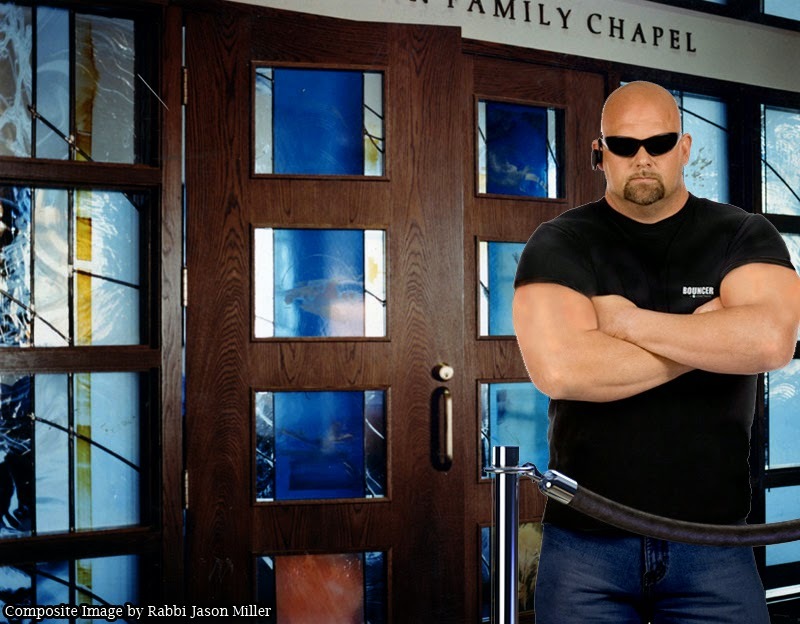 After a tense confrontation, the synagogue usher finally agrees to let the guy in, but he warns him sternly: "I better not catch you praying in there." There is a certain misnomer about the tradition of synagogues requiring tickets on the High Holidays. It is not that synagogues are trying to make Rosh Hashanah and Yom Kippur services like a sporting event (although some synagogues do have assigned seating). Rather, synagogues are trying to stay in business and be able to collect membership dues. For many Jewish people, the High Holiday services are the only "service" they find themselves using at the synagogue. Therefore, if congregations didn't require membership to attend those services, they wouldn't collect enough membership dues to balance the annual budget. Thus, High Holiday tickets are really just a way for congregations to collect dues. For many synagogues, the fiscal year begins over the summer so getting congregants to pay dues payments during the first quarter of the fiscal year is highly advantageous as they set the annual budget. Free High Holiday tickets is also a misnomer because just about any congregation offering complimentary attendance at their Rosh Hashanah and Yom Kippur prayer services is expecting donations in return for their generosity. In other words, in exchange for not charging a fee you will likely receive an empty self-addressed envelope with an expectation. No synagogue wants to turn anyone away from a prayerful experience on the High Holidays. They are just trying to keep their doors open and balance an often challenging budget. Appropros of this, Adina Kay-Gross wrote a particularly insightful article recently in Kveller.com about the difficulty many young families have paying for High Holiday tickets. I’m at home. My kids are upstairs napping. The mail arrives. I run to catch the carrier before he slams our mailbox cover, setting off a domino effect of barking dog and kids woken too soon. Top of the mail pile? Envelope addressed to my children. Not in the handwriting of their grandmothers. Who else sends them mail? I check return address: it was from the shul we had just visited for the challah baking extravaganza. I open the envelope up. Inside is a letter to my kids, thanking them for coming to the PJ library event, and two high holiday tickets, one for me and one for my husband, along with an invitation to join the congregation at Rosh Hashanah and Yom Kippur services, as guests of the synagogue. No fee required, no RSVP necessary, no literature on synagogue membership. No “pay for pray.” Just a warm and welcoming gesture from an established community to a new family in town. It was so simple, so menschy, and so right. Some synagogues will continue to require High Holiday tickets -- either as a perk of membership or as a fee for service for non-members. Other synagogues will offer free High Holiday services and hope to collect enough donations to be fiscally responsible throughout the year. Still other congregations will begin to experiment with other membership models such as voluntary dues and endowed High Holiday services so anyone who wishes can attend without a fee. Whatever the case may be, the most important thing is that everyone who wishes to gather communally in prayer during these Days of Awe will be able to -- regardless of financial ability. After all, it is the feeling of togetherness that we all seek during this season. Shanah Tovah! May it be a year of health, happiness and peace! Rabbi - where do I begin with my thoughts on this...I have lived in the Metro Detroit area all of my life and have struggled all of my adult life to find a place to attend high holiday services that did not require a paid ticket and where I could make a donation I could afford afterward. Most temples, synagogues etc. say they have a tiered plan however, they expect everyone of a certain age to make a certain amount of money and therefore be able to afford x amount for a ticket. If you can't afford that, you need to provide 3 years of tax returns to the finance committee and they will get back to you w/a reduced amount ticket (true story). Because I will not play this game, I have attended services in more places than I can count and not been able to create any type of affiliation. Luckily, for the last 7 years or so my family and I have attended services at a very small out of the way temple without the need of a tickets and although my we make a nice donation after the holidays we are still sent dues invoices every year which we ignore. That the reality of being a Jew at the High Holidays in Metro Detroit. Pay to pray indeed doen't sound very good, however, synagogues are not maintained by the government but by the congregation who has to pay a yearly membership or charge a fee from those who choose not to be members. My son comes from out of town so I get him a ticket, it's only fair. In my humble opinion, a policy of "Pay to Pray" is sacrilegious. As a long-time board member of a long-established shul, please understand that if a shul is going to provide for the needs of the Jewish community, we must be "business-minded" or close our doors. It may seem crass, and indeed it has been uncomfortable for those of us who serve on the board, but a synagogue IS a business. We pay for utilities, security, a very small administrative staff, our rabbi (that list is very long), keeping the heating and cooling going (and we're quickly reaching a point where repair will no longer be an option). Oh, and there are MUM dues and we're carrying over a deficit now. We welcome everyone, no matter what, whether they have paid dues or are on dues relief. I suspect I once felt as you do about "paying to pray," but not after having been a board member and donating so much time to support the shul. Communities aren't free anywhere that I know of. Chabad of Toledo welcomes all to High Holy Day services as with all services -- NO DUES REQUIRED! Chabad does not have a pay to pray policy and yet Chabad also has operational and capital expenses. All revenues received are totally by means of voluntary donations.